Kenton Dashiell, IITA Deputy Director General, Partnership for Delivery, has urged partners and staff in Rwanda to work collectively towards improving agricultural production and agribusiness investments in partnership with the youth. He spoke during an official visit to Rwanda on 12-18 September to engage stakeholders and partners. DDG Ken Dashiell with the Rwandan Minister of Agriculture, Dr Gerardine Mukeshimana and State Minister of Agriculture Tony Nsanganira. Dashiell shared experiences from some countries (Nigeria, Tanzania, and DR Congo) implementing the Youth Agripreneurs initiative with the support of IITA as well as the implementation plan of the soon-to-begin Empowering Novel Agribusiness-Led Employment for Youth in African Agriculture (ENABLE Youth) project that will be implemented by the Government, saying that “all hands must be on deck” for the project goals to be achieved in Rwanda. 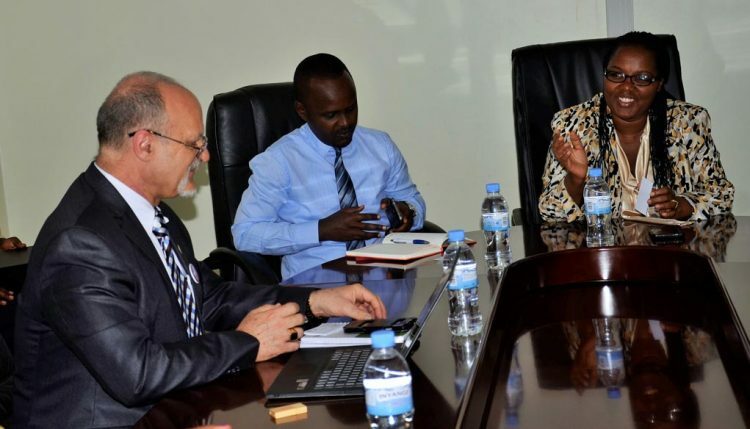 “We have to implement the best strategies to promote investments and tackle the challenges ahead to establish a dedicated program for the promotion of sustainable income generation and livelihood opportunities for the youth in Rwanda,” Dashiell said. During his week-long visit, Dashiell met with Gerardine Mukeshimana, Hon. Minister of Agriculture; Tony Nsanganira, Hon. Minister of State in charge of Agriculture; Daphrose Gahakwa, Acting Director General of Rwanda Agriculture Board (RAB); Joseph Nyirimana of the AfDB; Malick Haidara, Program Officer at the United States Agency for International Development; Charles Bucagu, Dean, Faculty of Agriculture; as well as representatives of IITA, the International Center for Tropical Agriculture, the International Potato Center, the World Agroforestry Center, and programs working in Rwanda. Mukeshimana praised IITA for its activities noting that they have helped to improve agricultural practices and production in the country. She also expressed interest in continuous collaboration with the Institute. Since 2006, IITA has led substantial investments in Rwanda, mainly through the Consortium for Improving Agriculture-based Livelihoods in Central Africa (CIALCA) project that invested in the intensification and diversification of cassava, banana, and maize-based systems, including aspects of value addition and nutrition. Through this program, over 5 PhD and various MSc projects were completed and partnerships established with development partners and policy makers with functional R4D platforms comprising CGIAR centers, NGOs (international and local), policymakers, farmers, and the private sector.